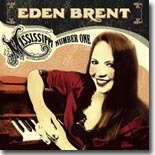 Mississippi pianist Eden Brent's new CD, Mississippi Number One, is so well-liked that two of our reviewers wrote rave reviews of it. Her disc is this month's Pick Hit. This month's Surprise pick hits the Southern Soul genre for a look at Bobby Wayne's Soul Station. New Orleans musician James Andrews teamed up with New Orleans legends Dr. John and Allen Toussaint about 10 or so years ago for the exquisite Satchmo of the Ghetto. It's this month's Flashback feature. Our What's New section features new releases from Mac Arnold, The Legendary Rhythm & Blues Revue, Albert Castiglia, Dan Treanor & Jack Hadley, Jeff Healey, Rick Fowler, Delta Highway, and more, plus a 1992 concert DVD featuring Albert Collins and a collection of great blues recordings from the Electro-Fi label.